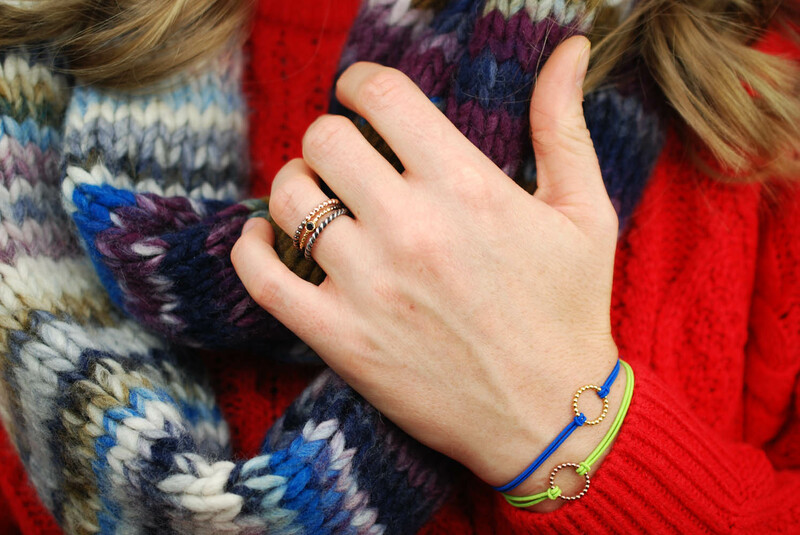 Ever wondered how to accessorize your jewellery in winter? And I don’t just mean to look good, I mean matching the right jewellery with the right clothes so you don’t get in a tangle. Your winter fashion! Being a jewellery maker-designer, I know the problems that winter fashion items can bring. Many people even stop wearing jewellery in the winter months. 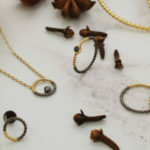 So, I’ve put together some tips to help you with your winter fashion and protect your jewellery. 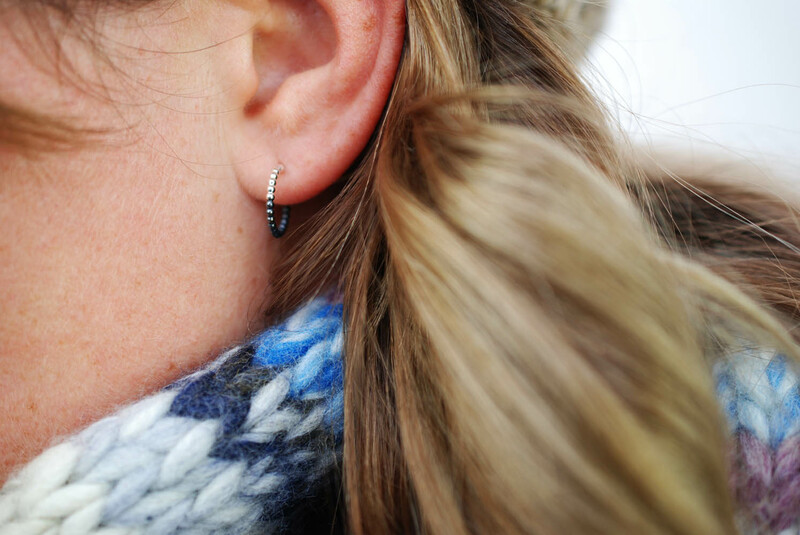 What not to wear: Avoid open back earrings (earrings with no butterflies) and big hooped earrings in the winter time. Big earrings can get caught on the threads of your scarf or hat. They can get yanked out of your ears as they get caught on the threads and it’s very easy to lose them. Wear instead: Studs and small hoops with a push backs (the fixings to hold earrings on your ears, commonly referred to as butterflies or scrolls), are a great option for the winter. They’re less likely to snag on threads and will still look impressive beneath the wrap of your warm winter clothes. You can see studs and small hoops beneath your wooly hat but they’re not so big that they will get caught in your scarf. Check out my mini beaded hoops in my BoulBoulle collection or my two-tone circle beaded circle studs here, which are perfect to wear with hats and scarfs. What not to wear: Necklaces on a long chain can get wrapped up and tangled in your winter coat or scarf. You get tied-up and the pendant can get lost somewhere inside your clothes so no one can see it. There’s no point dressing-up and completing your outfit with a stunning piece of jewellery if others can’t see it! Wear instead: Pendants on a short chain are easier to wear with big winter coats and scarfs. Look for pendants that are soldered to the chain, as they will always stay in place at the front of your necklace. I do this with all of my necklaces to keep them looking awesome! Check out my small circle and bead necklace on an 18-inch chain. Perfect for your winter fashion as it won’t get lost in your coat or scarf and will still look great. What not to wear: Bracelets with clasps, or with dangling features such as charm bracelets, can get caught in the sleeves of your jumpers and gloves. 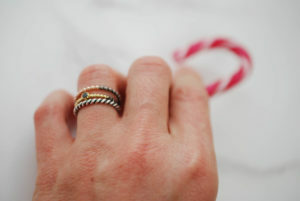 Wear instead: Snug fitting bracelets without a clasp, with elastic bands or solid metal bangles. The tight fit ensures you won’t pull them off with your gloves. It also means you won’t pull or break your precious charms when you’re taking off your woolly jumper or coat. Check out my charm bracelets with an elastic band. They fit snug on your wrist so they won’t get caught in your clothes and look great. They make a great stocking present too! What not to wear: Rings with precious stones that are claw set. Engagement rings often have this feature. Especially talon claws, like this owl-inspired bespoke engagement ring I made recently. Rings with stones in claw settings are the enemy of gloves. They can get caught in the thread of your jumpers or snag on the inside of your gloves. 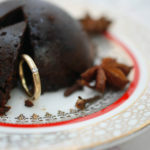 Wear instead: Solid metal rings with a rubover setting are ideal for winter, especially if they’re smooth and polished. But who wants to stop wearing their engagement ring throughout winter? Simply make sure your gloves are loose fitting or choose fingerless gloves where the material will sit lower on your finger than your ring. If the stone in your ring feels loose get in touch with me ASAP so I can tighten the claws for you. You don’t want to lose the stone just because you’re pulling gloves on and off at this time of year! Check out my two-tone beaded BoulBoulle rings made with smooth precious metals. They fit snug on your finger and won’t snag on the threads of your winter clothes. Winter, eh? Who would have thought that wrapping up warm in the colder months could cause such havoc in your winter fashion? 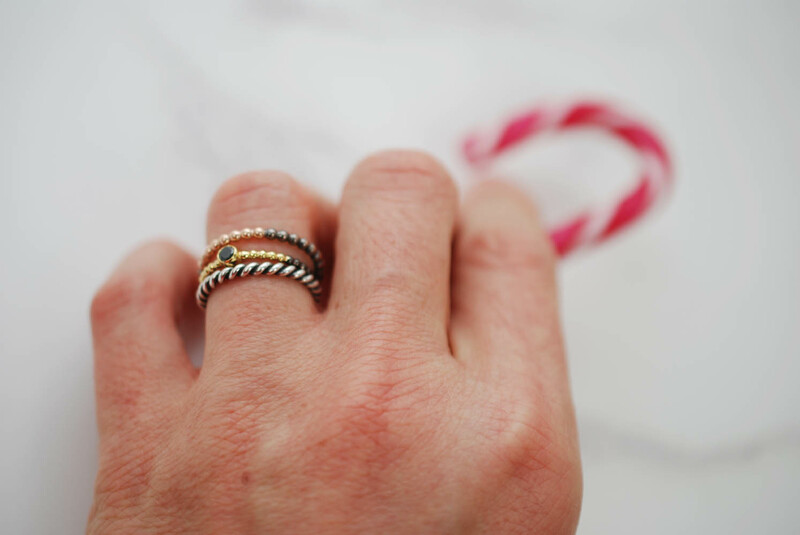 I hope these tips help you avoid having lost, broken jewellery this year. Keep wearing those perfect jewellery accessories for your winter fashion. Let’s not let winter ruin our fun! Don’t forget, if you want to order some bespoke jewellery gifts or handmade jewellery gifts before Christmas, to check my order deadlines. I will need to post it soon if you want it to arrive before Christmas day.